THE WOMBAT is the versatile, multi-sensor portable test bench developed by Epslog to measure properties on cores, directly at customer's facilities, anywhere, anytime. SURGICUT is the enabler for Epslog’s suit of advanced laboratory testing technologies, designed to provide an array of direct and versatile measurements on core samples. MORE DATA SOONER is a novel core analysis workflow based on the early and fast acquisition of high-resolution continuous profiles of properties. Test results are combined to estimate geomechanical and petrophysical properties and to map rock facies for an early and extensive calibration of well and reservoir models at different scales. Epslog core testing technologies are integrated in one compact and transportable test bench, THE WOMBAT, which only requires light logistical support and minimum sample preparation for fast and efficient testing campaigns anywhere in the world, at the onset of laboratory analysis programs. The first step in Epslog’s core analysis service consists in creating a perfectly levelled surface along the rock samples. It follows an automated motion-controlled procedure with micrometer accuracy designed to prevent any mechanical damage to the samples. The result is a perfectly levelled groove 1 cm wide and with a depth of penetration kept to the minimum - typically 2 to 3 mm deep. The groove reveals a smooth, horizontal surface of clean rock. This surgical opening of the core, the SURGICUT, offers unprecedented opportunities for an extensive suite of measurements on cores. It can be performed on samples of any shape and size: from sidewall plugs to whole cores before slabbing. Epslog scratch test services offer new perspectives for routine and special core analysis. The SURGICUT provides a unique opportunity for the acquisition of a wealth of high-quality data representative of the whole core interval. Epslog' services are designed to combine and integrate the large data set obtained from fresh cores with the Wombat, earlier and faster than with conventional laboratory testings. The main objective is to increase the value of core data and to enable a significant reduction of the uncertainty in many subsurface reservoir models and geomechanical studies. EPSLOG offers the highest quality on-site core testing services. Fully dedicated engineers mobilized at our customer's location operate our reliable hardware and software solutions. The following set of measurements are integrated with the Wombat and are realized in the SURGICUT. They all use the same core-based depth reference and are available on demand. The Scratch Test is the corner stone of the data acquisition and analysis integrated service proposed by Epslog. It is designed as the first step in comprehensive core analysis programs, yielding a continuous high-resolution profile of rock strength, equivalent to a series of Uniaxial Compressive Strength values. 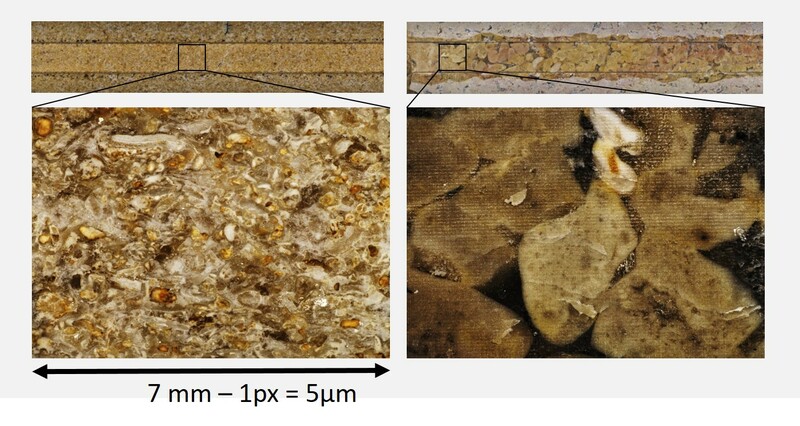 The rock strength is obtained from the analysis of several successive scratch passes at different depths of cut in the same groove, which confers robustness, coherence and reproducibility to the test results. The sonic test measures the travel time of an elastic wave between two state of the art miniaturised ultrasonic probes adapted to the groove width. Standard deliverables consist of high-resolution (2-4cm) continuous profiles of compressional and shear ultrasonic velocities & even on core sections unsuitable for plugging. Ultrasonic velocities & measured on core are used to calculate continuous profile of dynamic Poisson ratio and are combined with density profiles obtained from CT-scan images to derive profiles of the dynamic Young modulus. High-definition panoramic core pictures (35µm/pixel) of the SURGICUT are taken under natural and UV light and depth-matched with strength profiles. Ultra-high-definition panoramic core pictures (1.8µm/pixel), of the SURGICUT are taken under natural and UV light and depth-matched with strength profiles. A continuous evolution of the grain size distribution along the core. 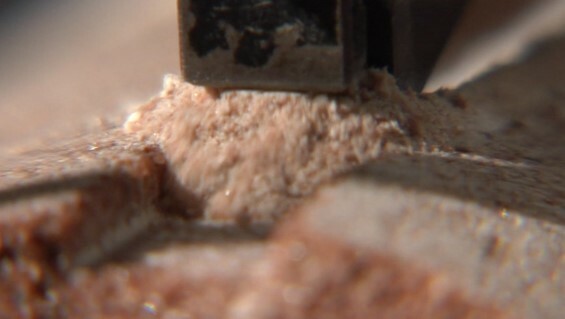 Rock powder is a by-product of the SURGICUT. Because the volume density (volume per unit of length) is kept constant along the SURGICUT length (along the core axis), the powder is evenly sampled along the core. This powder produces ad-hoc specimen to conduct elemental or mineralogical studies with XRF, XRD or FTIR analysis. The FTIR analysis is particularly attractive as they produce results extremely rapidly. Establishing robust correlations with well logs – The shear volume of scratch data increases the statistical significance of correlations between core data profiles and well logs. 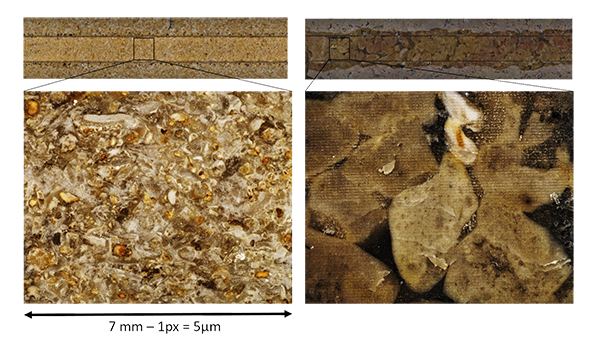 Core aging – Time lapse scratch test campaigns on the same core reveals the effect of aging or weathering on rock mechanical properties.